Mach5 |M5-115 M5-230/60 M5-230/50| Headhunter Inc. The Mach5 water pressure system from Headhunter represents a next quantum leap in pump technology with many advanced features and improvements over conventional water pressure pumps. An integrated control system provides instant dry run protection, and allows the pumps to be used with or without a pressure accumulator tank. 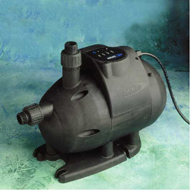 The Mach 5 pump incorporates a state-of-the-art multistage impeller system driven by a super-efficient water-cooled motor to generate up to 20 gallons per minute, instantaneously, on demand, and in virtual silence. An easy to read control panel on top of the pump provides visual indication of alarm status, as well as reset capability. 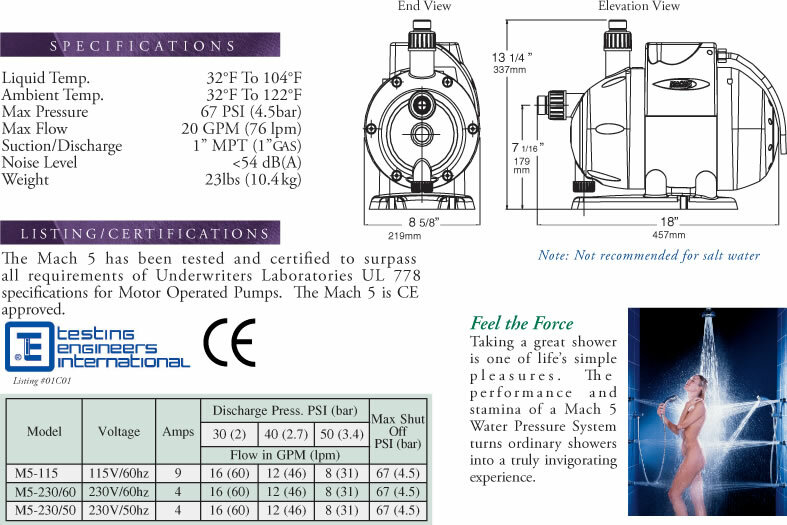 The Mach 5 has been tested and certified to surpass all requirements of Underwriters Laboratories UL 778 specifications for Motor Operated Pumps. The Mach 5 is CE approved.